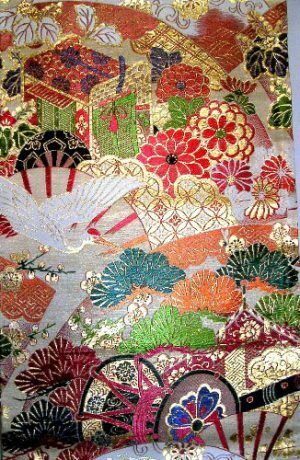 This is an exquisite, rare, hand woven Silk “Maru Obi,” which is the most formal and most expensive of the Japanese Obi. 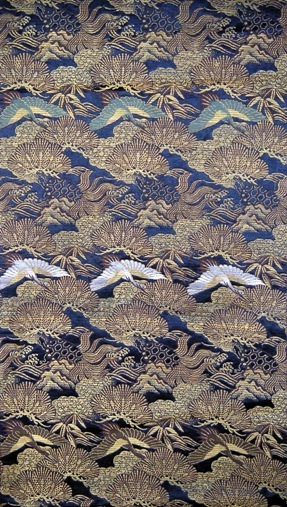 A Maru Obi has but one seam, and has been woven in a continuous repeat pattern and folded over to create 2 visions of the same design. 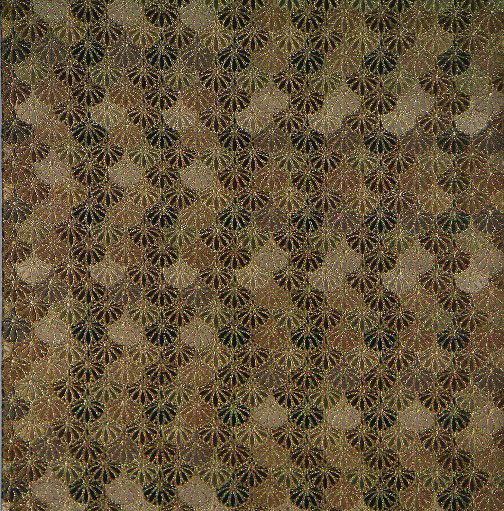 It is a design that has, traditionally, been referred to as “Meiji jimon:” a continuous, small, overall repeat pattern of Chrysanthemum. 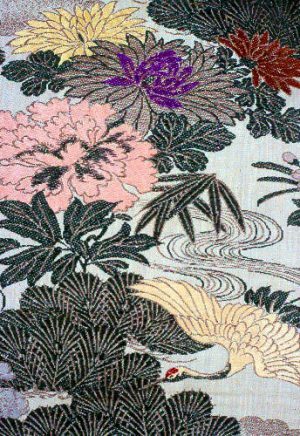 This is a very lustrous, finely woven Silk Obi that has a wonderful sheen that, when turned in different directions and in different light, will appear to change color. This is a sign of a very high quality Obi. The Chrysanthemum (“Kiku”) is a symbol of superior character, the light of the Sun, long life and virtue; and, it has been respected since ancient times. The sixteen petaled Chrysanthemum forms the crest of Japan’s imperial family. 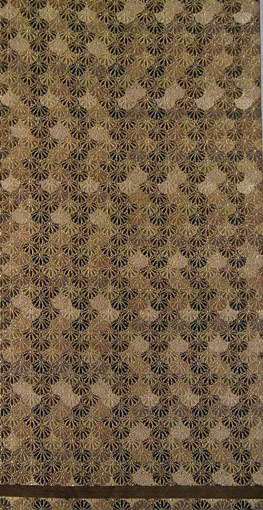 This finely detailed weaving of the Chrysanthemum has each petal outlined in pure Gold thread; while the varying shades of brown, from light tan to exquisite copper, highlighted by the gold threads, create an overall shimmer that is unparalleled. The colors are from natural dyes and are the more traditional colors of Japan. Brown (“Chiro”) is not usually considered a primary color, but it has occupied a position of prominence since ancient times in Japan. It is found in their reverence for nature, and use of unpainted wooden timbers found in Shrine buildings. It found its greatest aesthetic, however, in the tea ceremony and in the myriad uses of tea from health to medicine to dyes. 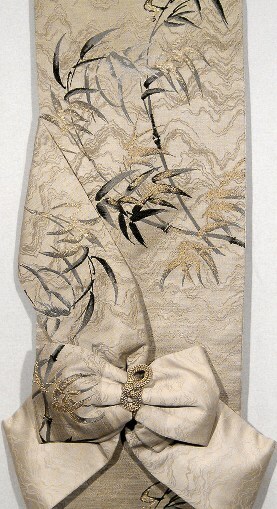 The intricacy of the design, and the unusual and striking use of pure gold threads detailing each petal of the Chrysanthemum attest to the artistry of the weaver, while the stripes at the bottom of the pattern denote that a woman of high rank and wealth in Japanese society wore this dramatic Obi. This is an exquisite example of a hand woven “Maru” Obi, the most formal and elaborate of the Obi.